In the previous part of this series, we talked about helpers available to you when using ConstraintLayout. In this part, we will focus on using animations when working with ConstraintLayouts. View Animations: these were used specifically to animate the visual properties of views like opacity and transparency. This is the initial way animations were implemented on Android. Property Animations: this helps us to alter properties of view objects to perform various view animations. View properties that can be altered include its translate, scale, and rotate properties. Drawable Animations: this uses an XML file to specify a list of drawables and runs them one after another to make an animation. Layout Transitions: this enables us to easily implement fade/move/resize animations when items are added to or removed from a ViewGroup, usually with just one line of code. 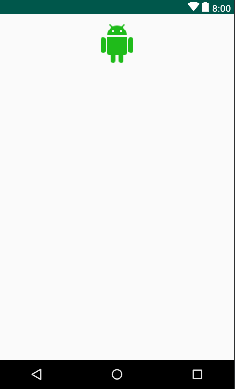 ConstraintLayout with [ConstraintSet](https://developer.android.com/reference/android/support/constraint/ConstraintSet)s - this gives us the ability to animate between two sets of constraints through the TransitionManager). The TranstionManager helps manage transitions when there is a change of scene. A scene represents either the entire user interface or a subset of the layout represented by a ViewGroup. 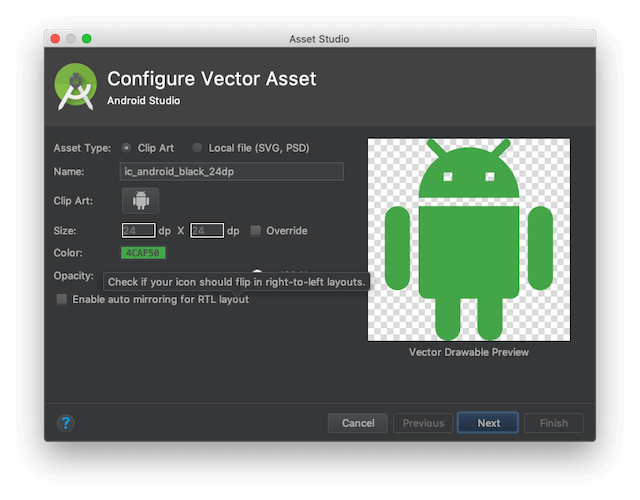 Android Studio (v3.0 or higher) installed on your machine. Download here. Ability to navigate the Android Studio IDE. Ability to use the layout editor provided by the Android Studio IDE. A basic understanding of Android development, especially layouts. Compared to the other methods of creating animations on Android, MotionLayout offers us a lot more flexibility in specifying animations for our apps. A MotionLayout is actually a subclass of the ConstraintLayout and allows you to make animations between two sets of constraints. As we already know, constraints are the building blocks for the layout, and every view must have constraints. The MotionLayout is also fully declarative. This means you can easily describe, in your XML file, how a transition should occur without any Java or Kotlin code. It can also animate any property of the system, not just layout attributes. Finally MotionLayout supports touch events and keyframes. This makes it possible to easily customize transitions to your own needs. In later parts of this article, we will see how this works using some examples. Although MotionLayout is a part of ConstraintLayout, there are some key differences. One key difference between ConstraintLayout and MotionLayout, at the XML level, is that the description of what MotionLayout will do is not necessarily contained in the same layout file. It is instead kept in a separate XML file, a MotionScene, that it references. This description will take precedence over the description in the layout file. This approach is very helpful as the layout file will contain only the views and their properties and not their positioning or movement. The MotionLayout is only available as part of the ConstraintLayout version 2.0 and above. As at the time of writing this article, this version of the library is still in its alpha stage. Sync your gradle files after that to make the library available for use. Motion provides meaning. Objects are presented to the user without breaking the continuity of experience even as they transform and reorganize. For our very first animation with MotionLayout, we are going to try to achieve the animation below. The ImageView increases in size as it moves to the bottom of the layout. In order to achieve this animation, we have to create two layout files, one for the initial position of the image and another for the final position of the image. 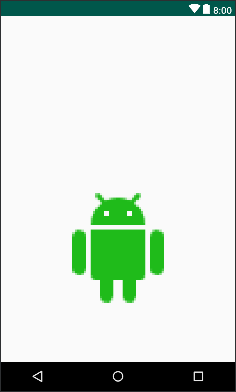 Next, let’s create the Android vector drawable. To do so, make sure the app directory in the Android file list is selected then click File > New > Vector Asset then set the hex color to #4CAF50 then click Next > Finish. Now that we have defined our initial and final position for our images, we need to create a MotionLayout layout file, we will call it motion_layout_01. This file will be very similar to our initial layout file except that instead of the root layout being a ConstraintLayout we will replace it with a MotionLayout. We also introduced two new attributes that we didn’t declare in our initial layout file. The app:layoutDescription and app:showPaths attributes. The showPaths attribute was used here to show the animation path in our example. This attribute is mainly for debugging and should not be used in a production app. Here we defined the default transition by specifying the constraintSetStart, constraintSetEnd and duration attributes. The constraintSetStart attribute tells MotionLayout the constraints for the initial position of the layout file motion_one_img_start we created earlier. The constraintSetEnd attribute tells MotionLayout the constraints for the final position of the layout file motion_one_img_end we created earlier. The duration attribute specifies the duration of the transition between the initial and final position. Finally to we used the OnClick event with a handler to instruct MotionLayout to start its transition. On the OnClick we specified the ID of the view that triggers the animation using the target attribute and the mode attribute. The mode attribute specifies the direction for the target view to move the animation. We used the toggle mode here so we can achieve a smooth back and forth transition between the initial and final position. Other available modes include: transitionToEnd, transitionToStart, jumpToEnd, jumpToStart. Finally, open the MainActivity class and change the setContentView parameter from R.layout.activity_main to R.layout.motion_layout_01 in the onCreate method. As mentioned before, the MotionScene drives the animation for MotionLayout by instructing the MotionLayout what to do. It is the engine room of our animations. A StateSet element that describes the states supported by the system. A state can be used to define the position of a layout before, during, and after the transition. A ConstraintSet that encapsulates all the positioning rules for your layout. It is always important to make sure that each ConstraintSet element contains all the constraints you want to apply to the view. It’s important because each constraint set will replace all existing constraints of the affected views. A Transition element that describes the transition between two states or ConstraintSets. Under the transition element, you can also specify event triggers like OnClick or OnSwipe and a KeyFrameSet. While making our first animation with MotionLayout above, we defined two layout files. One for the initial position, and one for the final position. An alternative to doing this is we can specify what constraints the initial and final layout positions will use directly in our MotionScene file. To do this we use the ConstraintSet element and define the initial constraints and the final constraints to be applied during the transition. Above, we have defined two ConstraintSet elements. One for our initial layout with an ID - start, and one for our final layout with ID - end. If we compare this to the animation we created earlier, we see that the constraint attributes for our start constraint set is similar to the constraint declared for the ImageView in our initial layout position in the file motion_one_img_start earlier. The same goes for our end ConstraintSet attributes. Finally instead of constraintSetStart and constraintSetEnd referencing the initial and final layouts we now reference the ids of the ConstraintSet for the initial and final constraint declared in our MotionScene file. One major reason to use a single file to manage our constraints is future-proofing. The upcoming MotionEditor in Android Studio will likely only support self-contained MotionScene files. Earlier, we mentioned that with MotionLayout we can perform transitions on attributes that are not related to the position only - these are called custom attributes. In the image above, you can see how the background color gradually changes during the animation and not just an abrupt change. Let’s see an example of how we can achieve this. A key thing to notice is that the view element we are going to apply the background color on has no backgroundColor attribute. We will instead declare this in our MotionScene file. We can now update the MainActivity to use the motion_layout_02 and run our app to see the animation replicated. This is the same animation we implemented in our first example. The difference here is that before arriving at the final state, the image moves to the left and rotates at an angle before reaching the final state. To achieve this sort of animation, MotionLayout offers us keyframes. Keyframes allow us to specify a point on the timeline of the animation where we can make additional changes to the animation. In the example above, we specified that at 50% of the animation timeline, the image should move to the left of the screen and rotate before arriving at the final state. To do this we will need to add the KeyFrameSet element to our MotionScene. Let’s consider how we would do this. To make a position change during the transition, we need to add a KeyPosition element under the KeyFrameSet. Above we specify the type and the direction, which is percentX for the x-axis, percentY for the y-axis. To make an attribute change during the transition, we add a KeyAttribute element to the KeyFrameSet. We can add any attribute of the view, widget or layout that we want to change here. For this example, we only want to change the rotation of the ImageView. Finally, the framePosition attribute is used to specify at what time during the animation the changes should be applied. Notice we did not need to change anything in our MotionLayout. We only specified the changes to be made in our MotionScene file. With great power comes great responsibility. However, so far MotionLayout will only provide its capabilities for its direct children . TransitionManager mentioned earlier can work with nested layout hierarchies as well as Activity transitions. In this article, we learned how to make a simple animation using MotionLayout. We also learned how the motion scene file helps MotionLayout drive animations. Making animations in Android has never been easier. Can’t wait to see what crazy animations you do with MotionLayout. In the final part of this series, we will concatenate all the knowledge we learned in all previous parts and build an application using ConstraintLayout.